Compensation of fork deflection by mast tilt. Fork carriage with FEM interface to allow standard attachments. 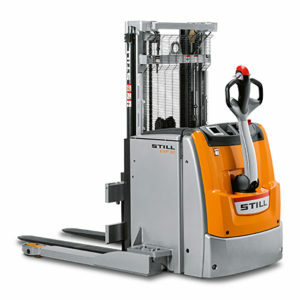 No straddle arms for easy and swift storage/retrieval of loads or to pick up enclosed load carriers. No driving licence required, instruction is sufficient. No mounting and leaving of the truck for quick and easy order picking. FEM fork carriage as interface for attachments, on request with up to 2 hydraulic functions. Large selection of batteries for any demand of service time and residual capacitie. Change of the battery over the side available on request. Masts: Duplex mast, duplex mast with full free lift and triplex mast with a lift height of up to 4.30 m.
Smooth, precise and direct electric steering. Many handy storage compartments on the battery cover. Display with alarm function, operating hour meter and inspection interval indicator. Automatic speed reduction when cornering. Powerful and enduring drive and lift pump motors. 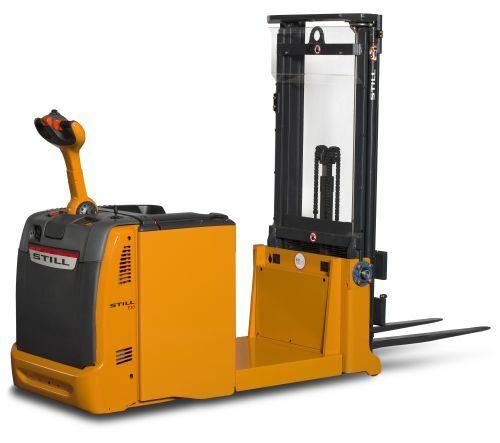 Rated load capacity up to 1.6 tons. Fully encapsulated, maintenance free 3-kW three-phase motor. Start of uphill drive without rolling back. Electric service brake with energy recuperation. 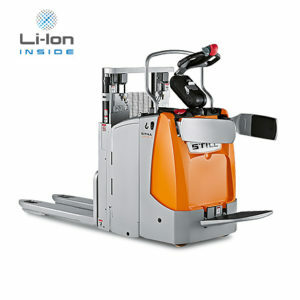 Ergonomic layout of controls for easy operation by left and right handed operators. Pressure buttons for horn, lift and lowering are always in reach without changing grip, also when operating the truck single-handed. 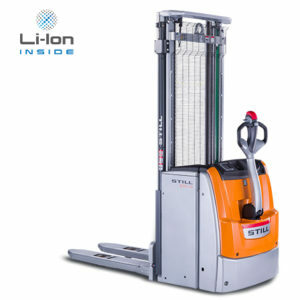 2 pairs of Polyurethane load rollers mounted on a rocker-carriage. Large Polyurethane drive wheel (∅ 254 x 102 mm). Modern CAN bus technology design. IP-54 protection to shield the complete electric system against dust and humidity. Progressive lowering of the fork carriage. Preparation for material flow management system (MMS). 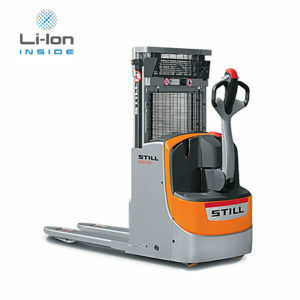 Cold store version up to –35 °C.